Pressure washers can help with cleaning anything around the house or at work. There are some areas that may be harder to get at than others and your first inclination may be to grab a ladder to reach that out of the way area, but there are other options that you can use. Pressure washer extension wands can give you that extra height without you having to climb up on a ladder. Your feet can stay firmly on the ground and you can reach the eaves of your home or other high space that you want to clean. This is safer for you and it can help to save your energy. It is important when you are considering pressure washer extension wands that you choose one that is sturdy and strong. There will be quite a bit of water flowing through the wand and you want a sturdy and strong wand that will allow you to control the water flow to the area that you are trying to get to. A sturdy pressure washer extension rod will not bend when you are trying to reach that high spot so that you can concentrate and focus the water where you want it. Pressure washer extension wands are normally made of stainless steel or chrome for maximum strength, but they may have an insulator grip so that you can hold it even when you are using a hot water pressure washer. Where can you use pressure washer extension wands? Most commonly, we think of places that are too high for us to reach, but they can also be useful in other places as well. This includes the undersides of cars or trucks that cannot be reached easily and on top of vans, trucks, and other vehicles. Whatever spot is hard to reach can be made cleaner much easier by using pressure washer extension wands. There are a variety of different sizes of pressure washer extension wands to enable you to find the one that will work best for your particular needs. From 36 inches to 79 inches, you are sure to find one that is long enough for your job. There are even telescoping pressure washer wands available that can be extended to up to 24 feet. This can give you the reach that you need for that hard to reach spot. It is much safer to use pressure washer extension wands than standing on a ladder or building a tower to enable you to reach those high spots. 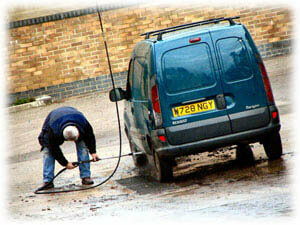 You can keep your feet firmly planted on the ground so that you can use both hands to move and use the pressure washer. This gives you more control, so that you will be able to get the job done in less time and with less energy. If you are tired of walking up and down the ladder trying to clean that high spot or are tired of bending over trying to clean that hard to reach spot, then consider purchasing one of the pressure washer extension rods. Your back and your legs will thank you for it.